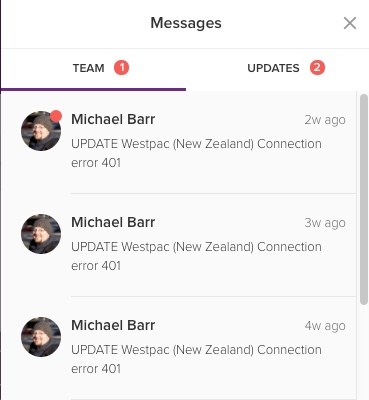 If you've received any new in-app messages from us you'll see a red badge, displaying the number of unread messages that are waiting in your inbox. To access the in-app messenger simply click on the envelope icon. The in-app messenger will appear in the right-hand portion of your screen. 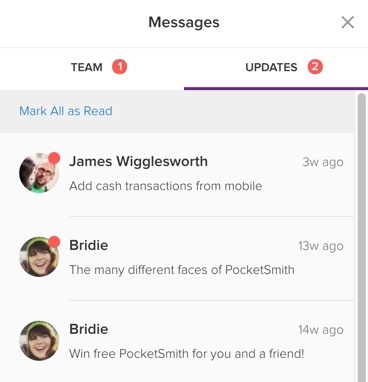 The Team tab is where you'll receive messages regarding bank feed issues that may affect your PocketSmith account. 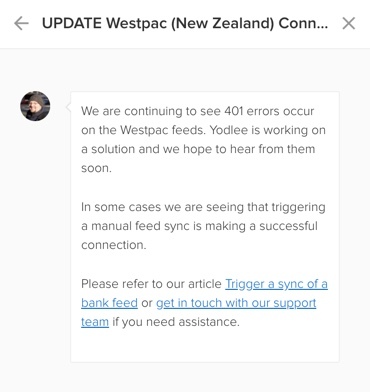 We'll do our best to send updates on bank feeds issues as they arise so this is a great place to check for progress on the resolution of any bank feed issues that may be affecting you! The Updates tab is where'll you'll receive newsletters and information regarding improvements and the introduction of new features to PocketSmith. To view any message, just click on it, and it will expand. To return to the inbox view, click the arrow in the top left corner.